The dream of the All in One is a simple standard that's rarely achieved. A full-power "desktop-in-a-display" that is simultaneously capable of serving as a general-use computer as well as a media streaming rig. Touch screens and Windows 8 are supposed to allow grab-and-go computing as well as more traditional deeper sessions. Gaming? Previously, 3D games were a tertiary concern, but this is rapidly changing, given the power-price-performance ratios found in high-end and high-mid-range laptops courtesy of the current crop of discrete mobile graphics parts. The challenge of the All in One form-factor is that, all too often, system builders are forced to cut corners in terms of the parts they integrate in order to cram everything into a thin-enough, big-enough display. Based on the number of average-speed All in Ones we've looked at over the years, building a lightning-fast AIO is much harder to accomplish than it sounds. You compromise power for convenience here. Acer's relatively new 7600U All in One embodies all of the good and the bad of this increasingly important category of system. On the surface, it looks well-designed. And with such a beautiful display, it has plenty of showroom game. Unfortunately, aside from pure media functions, just about every other dimension of this system is pokey, frustrating, and sometimes even puzzling - particularly at this price point. The first thing anyone notices about any All in One system is the screen. 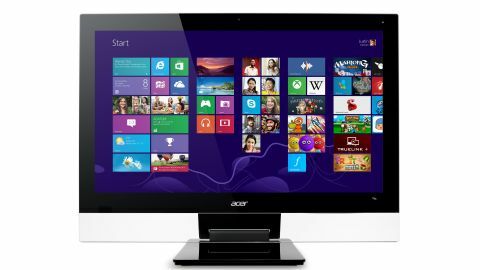 Acer acquits itself well here, with a thin (1.38 inches in middle, about 3 inches at the top), fashion-forward 1920 x 1080 LED capacitive multi-touch display. Screen quality is excellent, and easily fulfills the media center duties that All in Ones promise. This is a great display to watch HD movies and TV shows on from across the room. Unfortunately, the standard HD resolution is not so great for general, up-close productivity—a 2560x1440 display—like Apple's latest 27-inch iMac and Dell's XPS One 27 possess—would be much more effective,. At this price point, it should have the higher resolution. Aesthetically speaking, the design of the Aspire 7600U will probably elicit mixed reviews. With a thin, TV-style bezel, and a thin acrylic panel at the bottom of the system, it is certainly designed to look good in a living room. And while the whole acrylic/Lucite look is making a comeback in some regions, the style is not universally adored. One really nice touch is the Aspire 7600U's flexibility. You can tilt this system down to a 30 degree angle, which makes it perfect for standing and typing using Windows 8's improved 10-point touch controls. You can also quickly and easily adjust the position of the screen, making it quite versatile in a number of environments. Another much-appreciated and outright cool element of this AIO's design is the power socket, which is embedded into the tip of the system's stand. Very nicely done. The Aspire 7600U's keyboard and mouse extend the acrylic-oriented design. Unfortunately, both are inferior peripherals, almost to a maddening degree. The keyboard is particularly bad, with non-responsive keys and an infuriating space bar. Yes, this is subjective, but our bet is that you'll find yourself replacing the keyboard with something else almost immediately. Another more mild frustration: there are three sets of bright white lights on this system. The Acer logo lights up when it's on or in sleep mode. The power button stays lit when the device is off, and an odd KITT-style (from Knight Rider) series of lights dash across the top right-hand corner of the screen when the system is off. This is not the kind of AIO you can use in a bedroom.